Not a bad place to break down! Despite the day before having been filled with breakdowns and tantrums from Vera the boys had actually managed to travel about 90 miles, with the help of a tow. This meant they had actually managed to cover over half of the distance between Ulgii (where they had stayed the night before) and Khovd, the next major milestone. Rolling Thunder had camped at the side of a stream next to the yurt of the nomadic family they had shared dinner with the night before. This was about 500m from “Asian Highway 4”, a dusty gravel track that runs from the Russia/Mongolia border to the Mongolian capital Ulaanbaatar; next to this “highway” stood four Mongol Rally cars, two of which were very much broken! Everyone expected a long day of waiting for John to return with his rescue vehicle and therefore the convoy had a very lazy morning. Most only woke when the morning heat made the tents too uncomfortable to stay in. Dunc and Matt cooked a nice breakfast for the boys which included some eggs that CCBB had somehow managed to transport from Kazakhstan without breaking! Meanwhile Henry washed some of the boys clothes in the ice-cold river, they needed a catch up on washing after some of the previous sweaty days! Henry and Dan went for an early morning run, up a small mountain, and it wasn’t surprising that when they came back they needed a wash; they both braved the stream and then the others followed deciding that the cold was worth being clean for once. As the afternoon wore on the convoy found new ways to entertain themselves; drawing, reading and the inaugural game of Asian Highway cricket made the highlights! It soon became clear, however, that John hadn’t managed to find any help and at around 4 in the afternoon Rolling Thunder decided they should try and make some progress. After packing up and thanking the nomadic family for their hospitality the convoy set off with Aston Micra towing CCBB and The Bounre Dubbers Towing the Baked Potatoes’ Mini. 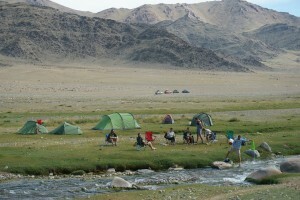 They had about 55 miles left to reach Khovd, which they felt was possible in an afternoon despite the towing. Matt was in the Mini to try and even up some weight, he was heaviest after all. Along flat sections going was good with Dan pushing the Micra up to around 30 mph and spaying Vera with stones, this resulted in a few chips in the windscreen and some more underwear that needed washing! Hills were a bit of a problem though, especially for the Polo with its 1L engine. Along the way there were a few tow rope snaps which both tested out the convoys rope tying skills and made the towing distance shorter. The biggest thing everyone learnt from this experience was to never buy an AA tow rope! Rolling Thunders makeshift camp site with Vera stricken in the background. Other than the tow rope problems and a few struggles up the hill, everything seemed to be going well, too well. 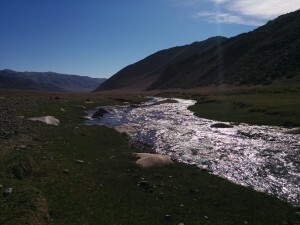 Soon after a nice flat stretch Rolling Thunder arrived at the toughest river crossing to date. Everyone waded out into the river to see how deep it was, at its deepest the river was about knee height and running at quite a pace. The Mini was never going to get through itself as it couldn’t start and would need a tow. The other three teams had to decide whether CCBB should go through after a jump start and risk cutting out in the river or to take a tow, which would be very difficult itself. Just as they had decided to take a punt and go through under their own steam a local turned up and offered a tow, this must have been a handy earner for him! CCBB, The Boune Dubbers and Jennifer agreed to a tow but bizarrely Dan from Aston Micra refused the man’s help “as a matter of principle” and vowed to get “Hilliary” through single-handedly. This instantly led to a nervous Chris disappearing out of sight, he probably finished off his latest pack of cigarettes! The first three teams were towed through by the local, with all of Vera’s orifices filled or covered with an assortment of socks and plastic bags. Next came Dan in the Micra, very quickly it must be said, who inevitably got stuck just over half way through. This lead to some frantic pushing from the others in the convoy as Dan kept Hilliary’s engine screaming with revs, eventually they managed to free her from the rocks and pushed her onto the river bank. Dan kept her running and although spluttering she was able to idle. Rolling Thunder still had two working cars, just! 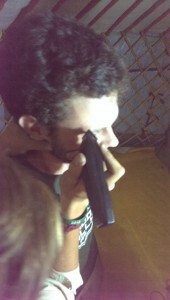 Chris getting his eyebrows clipped. 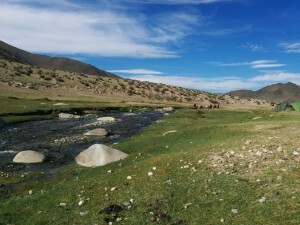 After a change of shoes for the rescue party and the return of Chris from his hideout, when he gave Dan a well deserved smack round the head, the convoy continued towing towards Khovd. A few more tow rope snaps occurred and but eventually the convoy made it to their destination. On the outskirts of the city were two yurts belonging to the same family, one for themselves and one for their guests. There was a mechanic living with them and he had been fixing Mongol Rally cars all summer, in fact there were lots of cars there when Rolling Thunder arrived to add four more to his waiting list. As the convoy parked their cars John came running over to say sorry for not being able to help but that he had tried his best, it didn’t matter in the end, Rolling Thunder had made it to town by sheer grit and determination! This was a cause for celebration so the boys and the rest of the convoy joined forces with some others that were staying, including a group of German’s travelling in a Mk 4 fiesta, to have a right good drinking session. The boys introduced the game of “Gin Face” to the others and Chris lost “Spin the Clipper”, things got a bit out of hand! The family that owned the yurt also cooked the convoy a very filling dinner, just what the boys needed. 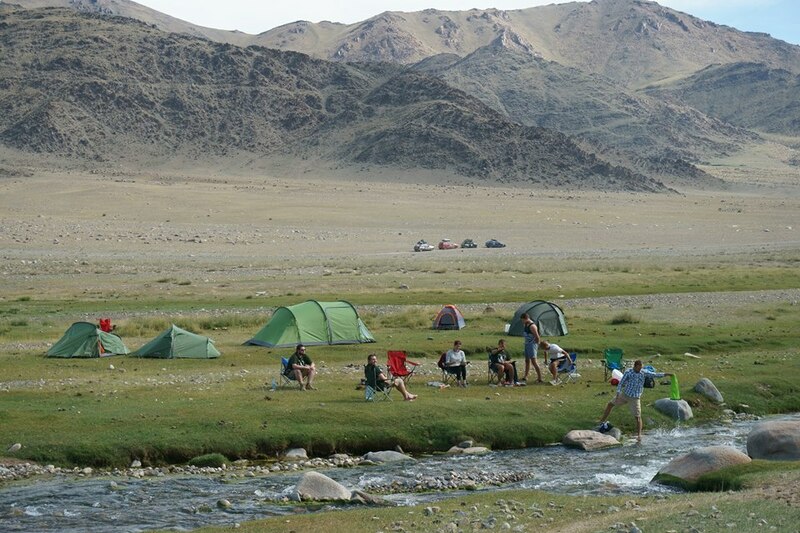 They also met Joe, a postgraduate student studying in Mongolia from Cambridge University who was effectively working as a translator between the ralliers and the family and generally looked after the whole operation. He seemed like a nice chap and joined the boys for a couple of games of Gin Face before they all turned in for a well earned rest!